Powerful inspirational quote by Harriet Tubman, a great African American Hero. 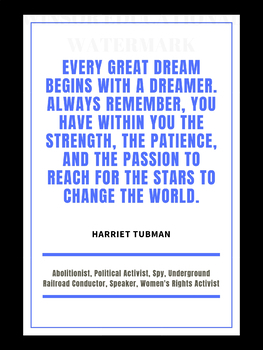 Harriet served as a Conductor on the Underground Railroad, a spy during the Civil War and worked with the Women's Movement. This print is great to encourage, to use in your office, home, classrooms, home schools and for Black History Month or Women's History month displays and celebrations. Poster measures 18 by 24 inches. Features the quote: "Every great dream begins with a dreamer. Always remember, you have within you the strength, the patience, and the passion to reach for the stars to change the world"
You will receive one pdf file. The watermark on the picture will disappear once you purchase and download begins.